I remember a session on listening which went very wrong and right at the same time. The trainer made an error of judgement when he asked a participant to share something personal about himself. The rest of us were asked to listen and then make suitable empathetic responses. The participant began to share. But what he shared was deeply personal and full of emotion. The trainer turned to us, a group of ten odd people, and asked us to respond empathetically. People tried to respond, but their responses sounded so trite in light of the depth of his emotions. A friend and I had no response to make. Too moved by what he shared, we chose to remain silent. At the end of the session, we gathered courage and went up to him to explain how we were silent only because any other response seemed trivial. He told us, that our silence was the only response he truly appreciated! Listening is an act of love. It demands that we be completely present to the other person. Most often, that means a meaningful silence, a hug or an arm around the other’s shoulder. When we truly listen with our hearts, we make space for the other to be herself or himself. I’m convinced that if every one had at least one person that listened to them without judgement and made space for them to be themselves, the world would be an infinitely better place. Today I am rather belatedly writing for the 1000 Voices of Compassion (click on the link for more posts and read about it below). The theme for this month is ‘Listening’. You can also find #1000Speak on Facebook,Twitter, the blog or the hashtag #1000Speak on social media. I am proud to have written for #1000Speak on the topics of Compassion, Bullying and Acceptance. I’m also linking in to Write Tribe’s #MondayMusings post. Interesting that the ONE thing I’m working at being better at, you choose to write about. I’ve discovered over the last few months that I am not a very good listener, even when I think I am. It takes practice, so, I’m practicing! Thanks for this Corinne! I’m practising too, Robyn. Not always easy, is it? Listening is a great skill and art that is so underrated. While we are taught about other forms of communication in schools and colleges (written and verbal communication and body language), listening is something that we have not been taught consciously. But it is something worth cultivating. Being a good listener helps us to not only solve many problems at work or home, but also to see the world through the eyes of others! You’re so right, Shilpa. I feel we learn the mechanics of listening but not the soul of it! Thank you so much for sharing, Esha. Aren’t we blessed to have people in our lives we can ‘unburden’ ourselves to. I’m glad you have your friend. This is a good reminder. I’m a much better listener, or reader and gentle commenter, as the case goes. I feel better for reading this. Thanks for sharing, Darla. I think most introverted people make better listeners. Do you agree? I love your posts, they are always full of emotional intelligent lolz I wrote a post called “Empathy is the key to success” sometimes the best action of love that we can do is to sit next to our loved once and listen without judging or giving our “advice”. I try, Sacha! 😉 And you’re so right about empathy. It’s being, not doing! To listen is an art. I almost, immediately tend to reply. Uhmm.. i guess, its high time, i mend my ways. Thanks for the reminder. It happens to the best of us, Ajay. So long as we’re aware we can attempt to be more sensitive! How lovely that you had a great example in your Dad, Wendy. I can understand why you miss him so much. Non-judgemental listeners are so hard to find. Isn’t it strange how our professional lives and personal lives are sometimes at a variance? I too am attempting to practice listening with love at home first. Lately I’ve been making a conscious effort to listen more. 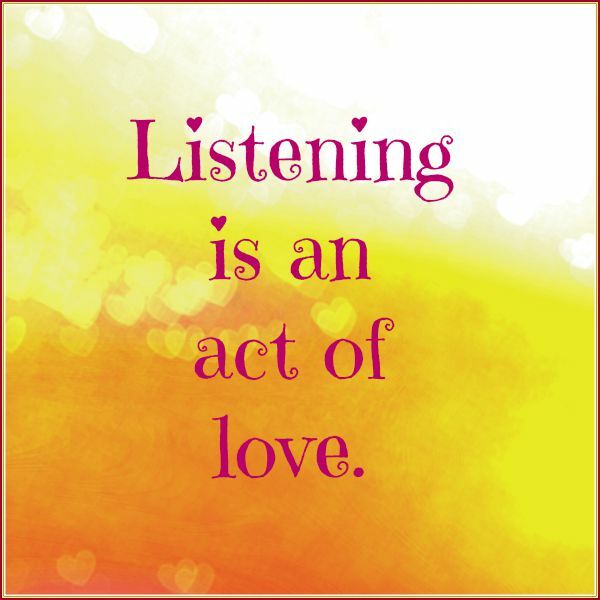 You’re right, listening is an act of love, and sometimes we just need to listen! Me too, Elsa. Thank you for stopping by! I understand exactly what you mean, Colleen. While I might not enjoy being called out, eventually I too see the lesson to be learnt. We might have the best of intentions, but we must also learn the right skills! So lovely to see you here. I think of you and your lovely little family with joy! Love to William and Carlos. I’m glad to have a professional underline my beliefs. Thanks, Susie! Listening is an art Corinne, I feel. Today, people only talk but hardly listen which is a quality in a human being. It is an art that requires a lot of love, Vishal. Thank you! Thanks for sharing that story and silence is many times the best response. In a hurry to respond, we forget what will the other person will feel. Right words are so important and should be used only in the right context. Any other combination can prove deadly for the life of a relationship! You’re so right, Parul. A lack of empathy is definitely a way to kill a relationship. I can understand this. I have one such friend who listens to all my thoughts – happy, sad, comic and utterly silly too. Telling her all I have never felt foolish. We used to live in different countries until sometime back but distance was never an issue. I try to reciprocate the same. It’s wonderful when we have that someone who gets us, Anamika. I’m glad that my husband is there for me! I find that silence works so much better and in so many more ways than words can. Words (when we talk) are rarely thought through, silence is always measured. Listening makes us better practitioners of silence. Even in day to day interactions, we find fewer people willing to listen and more of them ready to talk. Right, Shailaja. I wonder why we are so uncomfortable with silence. I find this especially true of us in India. Even online, when someone shares something personal, we rush to offer advice and solutions. Like I mentioned in my response to Irish’s comment, I find that I too tend to talk more these days, and it’s something I’m consciously trying to work on. Living and learning…I guess that’s what it’s all about, no? Awesome discussion and post! I’ve stated out loud a few times to the group I was speaking to that I wasn’t looking for advice or input but just needed to say something out loud when I had something I needed to say out loud. I just needed to release the fears and frustrations I was going through and let it go. I guess I wanted to have my feelings validated but at the same time just feel supported. Guess what? It didn’t work. The ones I shared it with piped in their two cents anyways. It’s very frustrating. Thanks for sharing, Irish. I believe that most of us are uncomfortable with deep feelings and silence. We have to rush to fill, what we perceive to be a void. Do you think we can be trained to be different? Is real listening a learnt behaviour or something that comes naturally to some? I find that of late, I too tend to rush with answers and solutions and have to consciously hold myself back. Listening is and act of love, and you’ve illustrated it so well here, Corinne! Thanks, Martha. I’m sure you are a great listener!